This pipe is a remarkable example of the pipe molder’s craft. It depicts a horse in good detail as it jumps over what appears to be bales of hay. 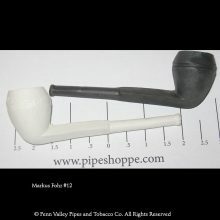 This is one of the many pipe style that include a figure or design on the stem or as part of the pipe bowl. If you are a collector of antique style pipes this is one that will add an equestrian flare to your collection. 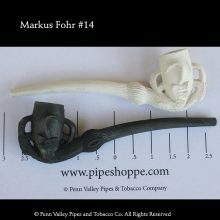 Markus Fohr is a pipe maker who lives in Montabaur, Germany, about 70 Miles from Frankfurt, Cologne and Düsseldorf in the region of Westerwald. His family has been making clay pipes for generations. He uses the fine white clay of the region which has been prized for centuries and is used to create the famous pottery of this region. 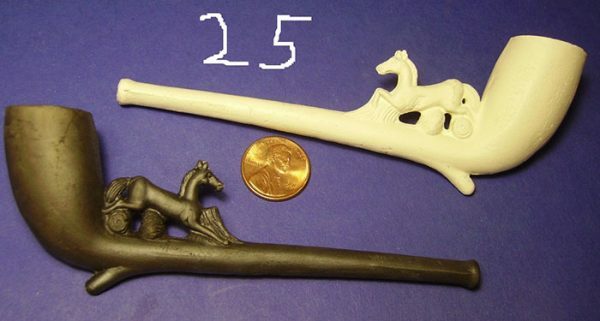 Some of the molds used are originals going back 240 years. 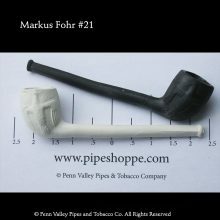 These pipes are made with the same white clay as the standard white Markus Fohr pipes, but have been finished in a separate process that smokes the finished pipe using wood chips resulting in a blacked pipe. Heating this pipe on coals or in a stove as a way of cleaning will burn off the residue inside the bowl, but should not affect the black finish of the pipe. We do however, recommend simply letting the pipe air dry. Most M. Fohr pipes will accept a pipe cleaner, but great care must be taken to avoid breaking the stem.